I woke up in a haze – the sun rose lazily in the misty skies that defused the bright orange sun into tiers of gray scale bars. My mind quickly cleared as I remembered that today would be pure adrenaline. The team of scientists set out with hopeful anticipation but as anyone experienced with monitoring migratory animals can tell you, there is no guarantee that the gazelles we saw yesterday would still be there today. Yet, environmentalists are optimistic people by nature. Lady Luck followed us. Two hours in, the chief scientist spotted a herd of 300 beyond the other hillside, so far away that I could not see them with my naked eye. We stopped strategically down wind from the herd so that they would not detect our presence. And we waited. Who knew whether the herd was still moving or had only stopped to graze? Our fate, and that of the gazelles, was in the hands of our guide. Pause. Green light. Time to set the net. It was hard work setting up and a great show of teamwork from the collective efforts of our twenty-plus team. Nets and poles that were prepped and built the day before were carried in old, Russian vans to the designated spots. Each net was 30 meters long, and we had set up 30 in nesting semi-circles. Two hours and plenty of high-fives later, it was done. The cars drove wide, past the outer rim of the gazelle herd encroaching behind them. Patience was crucial, as we did not want to risk scaring them away from the nets and making all our work futile. The experienced drivers of four approached as patiently as a pack of lions, stealthily striding towards its prey. Our steel lions rolled deftly towards their position. The walkie-talkies buzzed with fervor. Go! All vehicles rolled into action and collectively drove the gazelle herd to run towards the nets. Panic ensued amongst the herd, and the vehicles pushed madly into the GPS-signaled nets. All the television videos of a stampede cannot prepare you for the rush and high of being in a chase yourself. It was like donning the skin of a beast and seeing wildlife through the eyes of a predator. The chase was as magnificent as it was successful. It was a fruitful catch, 20 gazelles were ensnared, mostly females. To minimize the shock to their system, each was blindfolded immediately and their legs were tied. 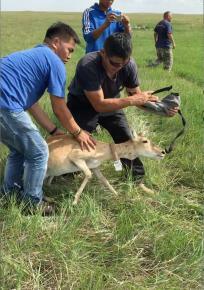 The gazelles were tagged, measured, collared, tested, and released. A veterinarian was on site to take blood samples and check the gums. With millions of wild grazers in Mongolia and their close proximity to livestock, wildlife management was never previously incorporated into the livestock medical profession. Despite that, how lucky we were that we did have two young wildlife veterinarians who decided to take up this specialty post-degree. I was so blessed to be part of this capture’s amazing feat. This year was the first time top international NGOs collaborated on gazelle research. A total of 11 organizations joined together including: TNC, Earthwatch, WWF, Denver Zoo, Mongolian Conservation Coalition, Eastern Mongolian Protected Area Administration, Administration of Khar Yamaat Nature Reserve, Environmental Agency of Dornod province, Mongolian Academy of Science, Central Laboratory of Veterinary Medicine, and Senckenberg Biodiversity and Climate Research Centre. Our group of scientists, rangers, volunteers, science students, and staff set out to fit 10 gazelles with satellite collars to monitor the movement of the herd over a two-year period. By overlapping the collar data with GIS maps, we can have a better understanding of vegetation, location of herders, existing infrastructure, and analysis of the seasons. Research is done only every four years. I wonder what new secrets the data will bring. The Mongolian gazelle is not only majestic, it is a key grassland species and one of the world’s last great migratory wonders. The Mongolian Eastern Steppe is the world’s largest intact grassland, with numerous endangered species and a traditional nomadic lifestyle rich in Mongolian culture. At one point it was estimated that over one million Mongolian gazelles lived on these grassy plains. Imagine the tremor of these magnificent beasts when they swept past the vast tundra of grass. Due to the threats of unsustainable hunting, habitat conversion, degrading lands, increased human density, infrastructure, and competition for food from livestock, gazelles in Mongolia have decreased 75% over the past 50 years. Conservation efforts have been introduced with community education and hunting license restrictions. Yet, something was still lacking. Later that afternoon, after we returned to camp and had a well-deserved lunch, I felt elation at having witnessed gazelles at such close range and optimism that surely, these are signs of change. A bit of sadness also nagged in my mind when I thought about the decline of these amazing creatures. Will all the efforts be in time to reverse the decline? But having spent a week with these incredible scientists working on joint efforts and consecutive studies, I am hopeful that gazelles will roam the Eastern Steppe for centuries to come. If the trample of bison hooves can paint vivid images of the Wild West in the U.S. as a snapshot of a time and place, I hope more people can continue to experience the thunderous movements of the migrating gazelles and better appreciate its native Mongolia backdrop.